Being a mermaid would be amazing. You could slide effortlessly through the water, as you would have the best mermaid tails for swimming. However, most of us are not born with flippers, so it might seem like this dream is an impossibility. Thankfully, technology doesn’t listen to impossibilities. Recently, faux mermaid tails have been appearing on the market that are more than just props for photo shoots. These tails are water-safe, allowing you to swim in them easily. Sounds Awesome doesn’t it? You can glide through the water like the Little Mermaid, and then pull off your tail to walk on land again. In this article, we will give you all the information you need to pick the proper mermaid tail. After that, we will review the absolute best tails on the market for 2019. 1 What is a Swimmable Mermaid Tail? 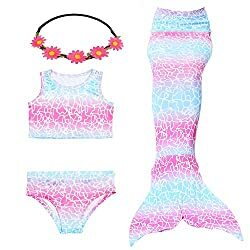 3 Which Mermaid Tail Should I Buy? 6 Are Swimming Mermaid Tails Safe? 9.1 What Size Tail do I Need? 9.4 What is normal Wear? A mermaid tail is, at its heart, a sleeve or tube that encompasses the wearer’s body from their waist to their ankles. At the ankles, there are enclosing fins, or a monofin which forms the actual tail. These fins provide structure to the fluke. They will also propel you forward when swimming. For those who don’t know, a mermaid is a beautiful, mythical lady of the ocean. Her lower half is a fish’s tail, and her upper half is a human. The male of the species is called a merman. Mermaids have been a fixture of folklore for centuries. Anthropologists believe that the origin of the mermaid myth was sailors sighting an ocean creature called a dugong and then embelishing the story. The first mermaid stories ever recorded were found in Syria and dated to about 100 BCE. In these early stories, a goddess, Atargatis loved a mortal man but accidentally killed him. In shame, she leaped into a lake and became a fish. However, the water would not conceal her beauty, so she instead became a mermaid. These days, mermaids are a standard part of a lot of pop culture. The fairy tale, The Little Mermaid by Hans Christian Andersen for example, was adapted into a movie with a much happier ending by Disney. 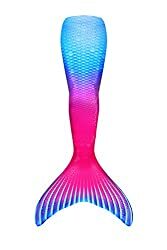 With all this press, is it no wonder mermaid tails are so popular? There are so many mermaid tails out there that it can be difficult to find the right one for you. In fact, your imagination is really the limit, as far as design is concerned. There are mermaid tails made to look like any type of fish imaginable. There are even companies which will craft you a custom-made tail. If you want a tail that looks like your pet goldfish, for example, it’s possible to have one. Using a mermaid tail is simple once you get the hang of it. However, there are some instructions you need to follow. Make sure your monofin is properly inserted into your tail. Once you are at the waterside, roll down the tail fabric until you can see the monofin and the foot holes. Insert your feet into the holes. 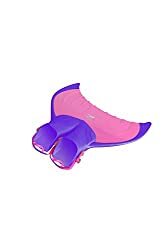 It may take a little time to get them in there properly, as the monofin is designed to hold your feet securely in place. Once your feet are in securely, gently tug the tail fabric up over your legs, up to your waist. Slide carefully into the water and swim, using a dolphin kick to propel yourself through the water. Are Swimming Mermaid Tails Safe? Mermaid tails are safe, if used properly. However, before buying one, it is important to know some basic safety information, especially if you are planning on buying one of the many tails for kids. Make sure that you are able to swim. If you can’t swim well already, a swimmable mermaid tail is not suitable for you. If the tail is for a child, never allow them to swim alone. Make sure that your tail is properly sized and not too large. Having a large tail means that it won’t fit properly and may fall off. If you are swimming in salt water or natural bodies of water, make sure to keep your tail from snagging. Do not try to hop, walk or climb stairs in a monofin. Do not put on your tail until you reach the water’s edge. All tails must have some form of safety release. Familiarize yourself with the safety mechanisms for your particular tail.. If you are going to share your tail with others, make sure they know the rules, too. Knowledge is power. If you intend on buying a mermaid fin, you might enjoy learning some interesting facts. Not all mermaid tails use monofins. However, those that don’t still have stiff flukes to propel you through the water. When wearing a mermaid tail, you can’t swim as you normally would. Instead, you must utilize the mermaid kick, an up and down wavelike motion created by moving both feet together. Though premade mermaid tails come in various beautiful designs, it is possible to have a tail custom-made for you. Simply find the company you want to use, draw a design of your tail or give them a reference picture, and they will do the rest. Monofins aren’t just used in mermaid tails. They are used in other forms of swimming and diving too. 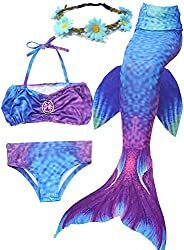 Sometimes, the mermaid swimsuit is even sold as a mermaid tail with Monofin. That way you don’t have to buy one separately. There are many shapes of mermaid tail. Anything from regular fish tails to fan tails like angelfish have is possible. Now You Can Be a Real Mermaid! A mermaid tail is an investment, suited for anyone. There are adult mermaid tails for swimming as well as tails for children. However, as with most things, there are some factors that should be considered before purchase. Mermaid tails are made of a variety of materials. Neoprene, nylon and polyester are common. Each type of material has its own advantages and disadvantages. Furthermore, the higher the quality of the material is, the higher the price of the tail will be. Lycra and spandex are some of the easiest fabrics to work with. For this reason, fabric tails are some of the most cheap mermaid tails on the market.. This makes them perfect for beginners, or someone who is not sure yet if the hobby of mermaid swimming is for them. Before buying a fabric tail, there are a few things you need to check. If you are in person, touch the tail. It should be smooth, opaque, and more like nylon than cotton. Also, it should have some stretch, both lengthwise and widthwise. This stretch will allow you to put the tail on more easily, as well as ensuring that your movements won’t be impaired. Also, be aware that fabric tails are not usually just spandex or just lycra. Usually the composition of the tail fabric is a blend, for example spandex and polyester. Neoprene is a synthetic rubber material. It comes in sheets, and can be sewn. Generally, this material is used in dive-grade wetsuits because of its durability and insulation. Neoprene is damaged by heat. This means you cannot wear a neoprene tail in a hot tub. You also can’t store it in a burning hot closet or leave it in your car in summer. Putting constant stress on your neoprene tail can damage it. Do not hang it on a hanger. Neoprene tails are best stored flat. Though neoprin may sound like neoprene, they are not the same material. Where meoprene is rubber covered with nylon or lycra on both sides, neoprin is a spacer material. Its two sides are held together with a core of thin fibers. Because of this core composition, this fabric is very stretchy. Unfortunately, the fabric has no elasticity. Once it is stretched, it won’t return to its natural shape. Another downside to using neoprin is that since water reaches the core, it takes much longer to dry. This is even more a problem when combined with certain kinds of latex, as they can be damaged by water. Like the tail itself, your monofin can be made of a variety of materials. Fiberglass monofins are stiffer and more rigid. This makes them far better at propelling you through the water. They are also what professional swimmers and divers use. However, there is a downside. Fiberglass monofins are very expensive, with some ranging to nearly $300. However, if you intend on swimming in the ocean, it is recommended that you use a fiberglass fin. Lexan is the brand name for a clear polycarbonate plastic sheet. It’s strong and durable. Furthermore, because it’s clear, it’s often used for crafting beautiful translucent fins. Though lexan is strong, the stresses encountered by swimmers are high. You will need to make sure your monofin is made of thicker lexan or several thin layers glued together. Now that you know what materials are used to make both the tail and the monofin, it’s necessary to discuss a little about tail coatings. Coatings for mermaid tails help them look much more realistic and protect the inner fabric. There are two types of tail coatings, silicone and latex. Both these tail coatings have their own advantages and disadvantages. Silicone is much more realistic looking. It is also far stretchier, making it a great coating. However, this coating is heavy. It can weigh up to 60 pounds, depending what material your tail is made of. This can make it difficult, if not almost impossible to leave the water depending on the weight of your tail. Therefore, it is not always the wisest choice. Latex is far less expensive than silicone and still looks reasonably realistic. Also on the positive side it is more lightweight. However, latex won’t last you nearly as long as silicone will. The breakdown of the latex is also sped up by certain factors. UV rays and constant stress can shorten the life of your latex-coated tail. Now that you understand the wide variety of tail materials out there, it’s time to discuss size. After all, you do not want to buy a tail that does not fit. Most retailers have size charts. Study the chart and pick the size that best fits you or your child. Some retailers sell only children’s mermaid tails. Others sell only ones for adults. Mermaid tails can get dirty from simple everyday use. That is why washing them is really important. If you or your child plans on using your tail a lot, it pays to get a machine washable tail. Then you can simply toss it into the wash on the gentle cycle. For tails which can’t be machine washed, you will need to hand wash them. That can get tedious quickly. It is possible to swim in a tail without a monofin. 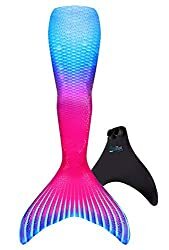 However, if you plan on swimming with one, you will want a tail that will fit your fluke..
Also, some mermaid tails actually come with a monofin. They tend to be more expensive. What do you think of when you think of a mermaid tail? If you’re like most of us, you think of bright, shiny colors.. However, there are many other possible designs. There are sparkling mermaid tails, and ones that are translucent as well as the colorful ones we all know and love. If you prefer a more natural fish scale look, there is bound to be a tail that will fit that aesthetic as well. It is important to consider the quality of materials used in your mermaid tail. If you fail to do this, you will wind up with a tail that doesn’t last as long. However, be aware that you will pay for the quality. Materials for making the tail cost more, and thereby the tail makers can charge more for it. What Size Tail do I Need? Even though most websites for buying mermaid tails have size charts, it can be important to know what size tail you need. We will show you how to measure for a tail below. To determine the size of tail you need, you have to make a few measurements. We will begin with the waist measurement. Measure yourself around the narrowest part of your natural waist. When you have done that, add two inches. This will give your tail the stretch necessary to put it on without being so loose as to fall off. The second measurement you need to take is for the tail length. Measure your body along your back from your waist to the floor. To do this, stand with your feet close together. Then measure around the fullest part of your hips. This measure ensures that your tail will fit properly all the way down. A mermaid tail is an investment. If you want to ensure it holds up as much as possible, it is important to know how to care for it. The areas on your mermaid tail that will receive the most wear and tear are your heels, knees and the tail tips..
For this reason, it’s important to avoid kneeling in the pool. It’s also important to not stand on your tail. Rubbing against the side of the pool, stairs, or rocks if you’re swimming in the ocean is also a bad idea. The mermaid tail needs a good rinse after every use, no matter whether you’re taking a swim in a pool or a dip in the ocean..
Chlorinated water can cause damage and discoloration to the tail fabric. When rinsing your tail, always use either warm or cool water. Hot water can damage your tail. To dry the tail after rinsing, invest in a clothes drying rack and lay the tail flat on it. Hanging it while wet can lead to excess stretching. As tempting as it would be to use your tail while in a hot tub, this isn’t a good idea. As mentioned before, hot water can cause some serious issues for you. It can damage tail fabric as well as causing discoloration. On a mermaid tail, where you have a specific design, this can be a death sentence. Do you need to get around? If so, the temptation may be to hop around with your tail on. Don’t do it. This is the absolute fastest way to damage an expensive tail. If, for some reason you need to be out of the water without taking off your tail, make sure to avoid any rough or sharp surfaces that could rip it. It is a good idea to invest in a yoga mat or a large fluffy towel to sit on. People will love when you swim in a mermaid tail. Small children are especially fond of this sort of swimwear. However, they might try to tug on the fabric, or grab at your fins to make sure they’re real.. You should avoid letting anyone tug on the tail. It is also important, if swimming in the ocean, to avoid snagging yourself on rocks or other debris. When removing your monofin, please be careful. The material that makes up your tail is thin. Yanking out your monofin can slice the tail open and make it completely useless. It may be tempting to dry your tail in the sun. This isn’t a good idea. Nylon, latex and other plastics will melt in direct heat, destroying your tail. No matter how well you care for your tail, it is going to take damage. That is just part of life. However, how do you as a user tell what is just normal wear and tear? Better yet, how do you fix the damage that naturally occurs? Those things are what this section will discuss. Learning how to repair a mermaid tail and what natural processes can damage it will make it last much longer. Even if your mermaid tail is safe for chlorinated water, prolonged exposure to the chemical will slowly destroy your tail. The same holds true for saltwater. Therefore, it is to be expected that some general fading will occur. To repair this, you might need to replace the tail skin. If it is a painted tail, you might need to repaint it. Stretching is another thing which can damage your tail. It occurs naturally over time. Though stretching occurs naturally, it can be much worse if you aren’t gentle on your tail when putting it on, drying it or inserting your monofin. No matter how careful you are, over time the tips of your mermaid fins will wear down. However, this doesn’t have to be the end of your mermaid tail if you take a couple of precautions first. When your flukes get scraped, you can apply protector tape to them. This is not like duct tape or scotch tape. It is made especially for tail repair. Protector tape is clear, waterproof and long-lasting and can save your tail from scrapes, holes in the tail skin and other damages. Now you know everything you need to know to purchase a mermaid tail for swimming. However, there are so many things to keep track of that the actual purchase can still be confusing. That is why we have picked some of our very favorite mermaid tails to show you. By the time you finish this section, you will have a better idea of what types of tails and monofins are available on the market. Fin Fun is one of the leading manufacturers of quality mermaid tails. These tails are made to last for years to come. Fin Fun tails are made from swimsuit material. They are designed to be both stretchy and comfortable and to make the perfect shape in the water. If you want a realistic tail, you can’t go wrong with Fin Fun. Their tails have a very interesting scale pattern that makes the scales look three-dimensional when wet for added realism. If you buy a Fin Fun tail, you won’t have to worry about purchasing a separate monofin. Fin Fun includes one of their patented monofins with each order. These monofins are built to be durable, flexible and strong. Further, they have a neoprene cover, with additional neoprene on the tips to aid in tail tip durability. For safety, you can easily remove the fin. There are no annoying straps to grab for. Simply kick and tug and your feet are free. That way, if there is an emergency, you can easily swim away. 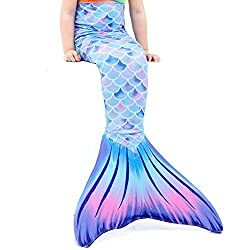 Are you looking for a mermaid tail for your child? If so, Play Tailor offers a really good, cheap tail. This tail comes in a variety of colors, including rainbow. Pick the one best suited to your child, or let them pick their own color. The Play Tailor line are made from a combination of polyester and spandex. When using one of these tails, it is important to be careful to ensure that your monofin is not sharp as you don’t want to rip the fabric. Play Tailor employs strict quality control. They will check your tail before it is packed, ensuring you always get a product you will be proud to give your child. These printed mermaid tails are also affordable. Play Tailor is always revolutionizing their supply chain and passing the savings on to you. Play Tailor tails are not machine washable. You will need to handwash them with cool water and lay flat to dry. The monofin is also not included. However, they will fit most 16-20-inch monofins. 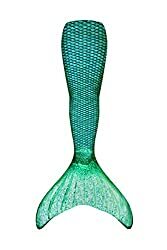 The Mayskey sparkle mermaid tail is a perfect gift for a child who wants to be a mermaid. It also comes with a monofin, so you do not have to buy one. The bottom of this mermaid tail is open. This means that your child can walk to the water before putting on the monofin and sliding in. The monofin features adjustable foot straps. This way, it can adjust to fit your child’s feet, even as they grow. The one downside is that this fabric stains easily. Prepare to scrub it to get out the grime of everyday use. If you have ever used a Fin Fun tail, you know exactly how fun it can be. However, the normal tails are not all that Fin Fun offers. There are limited edition tails as well. The limited edition tails feature special patterns and are only available for a limited time. However, that isn’t the only benefit. These tails feature a special, shiny dotted fabric cover only available in the limited edition series. They are also machine washable. To wash them in a washing machine, use the gentle cycle on cold. Do not dry them in the dryer. 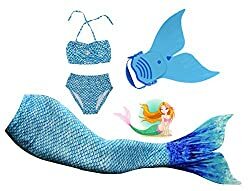 This mermaid tail set from Galldeals comes complete with the best swimsuit, tail costume and even a flowered headband. However, it doesn’t come with a monofin. This tail, as it comes is meant to be more of a costume piece. However, if you add a monofin it becomes a swimmable tail. This is another tail which is not machine washable. Handwash it, and dry by laying flat or hanging it up. Do you want to swim faster? If so, then the Suntail Mermaid’s patented monofin is the best on the market. In a speed test, Suntail monofins win every time. These tails are also best for mermaid tricks. The reason for this is their neoprene foot pockets. In a normal monofin, the feet are kept together. Separating the feet into separate pockets allows for a better range of movement, better flips and better stability in the water. Furthermore, there are many colors of the monofin. You don’t have to deal with basic black anymore. This set comes with a monofin that matches the high-quality mermaid tail. Speaking of the tail, it is made of light, breathable, sparkly swimsuit fabric that won’t weigh you down in the water. Be careful to not rub the sparkle fabric across rough surfaces. The sparkles can be scraped off. Be careful when washing these tails. Handwash only, as the washer and dryer can scrape off the sparkles too. Camlinbo is another three-piece mermaid tail swimsuit. There is no monofin. This set comes with a bikini top and bottoms. There is also a shiny, sparkly mermaid tail and a random flowered headband. The bottom of the tail closes with snaps. Add your own monofin and snap the tail closed around it. This tail set works for children ages 3-12. Sadly, there are no adult sizes available from this company. The Linden Mermaid Tail is super durable. It is designed to hold up to anything you throw at it. Furthermore it’s adjustable. Unlike most monofins, this one includes foam inserts which will allow it to fit a child. If you are an adult, simply take off the inserts and you’re ready to swim. However, if you wear above a women’s size four, this probably won’t fit you. To protect the lining of your in-ground pool, the Linden Mermaid body fin has rubber edges. That way when you push off the side or bottom of the swimming pool, you won’t tear the lining. Do you have a monofin that you love but still want the functionality and durability of a Fin Fun tail? If so, then this will make you happy. Fin Fun sells their amazing mermaid tails without monofins, as well. If you have had a Fin Fun tail in the past that has worn down to the point that you can’t repair the holes with protector tape, it’s time for a new tail skin. These tails also feature a very realistic scale pattern. On land, they seem to be actual fish scales. In water, however, they magically transform into mermaid scales that really shine. Fin Fun also sells their premium limited edition tails without monofins. Choose the amazing pattern you want, and use any monofin. The tail fabric is stretchy, meaning that it will easily fit around most monofins, providing you with ours of enjoyment. As usual, the fabric of these tails feature a shiny, dotted cover not found on the regular designs. They’re only around for a limited time! Get yours today. Mermaid swimming is a great chance to get some much-needed exercise. It strengthens your core muscles, and increases your upper body strength. 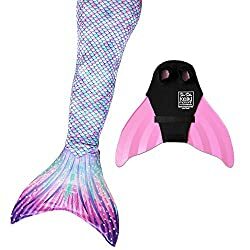 It is a great sport for all ages, but to properly swim like a mermaid you will need a proper mermaid tail and a monofin. There are several considerations you must make when choosing a tail. Size, quality and materials are all important factors in deciding what tail is right for you, as is the design. Taking care of your tail once you have invested in it is also important. Be careful how you wash and dry your tail, and make sure to rinse it off after every use to prevent premature aging. Now you know everything there is to know about mermaid tails. It’s time for you to go out and explore the amazing versatility that exists on the market and buy yourself the best mermaid tails for swimming.